HEY THERE FRIENDS! The BFFs are back – kind of! Recording separately in their pockets of time between events! Today we discuss travel. Should you travel out of province to conventions/events? What kind of things do you need to think about? Where should I go? DON’T GET LOST. Sam is off this week and so you’ve got your favourite adequate BFF CLARE here to talk updates and publishing advice! Thanks to everyone who nom’d us for an Aurora Award! Oh no, did you think we died? THINK AGAIN. May, what May? Pretty sure the month goes April, then June. Right?? Anyway, on this episode, which we recorded the end of April, we present to you, our take on this year’s Calgary Comic & Entertainment Expo, and our selling tips for independent creators selling at cons. Also SAM WAS A GUEST but did she get a free lunch???? Listen and talk about us with your best friend while you sit in the cozy darkness of the void. Trigger warning: sexual harassment. 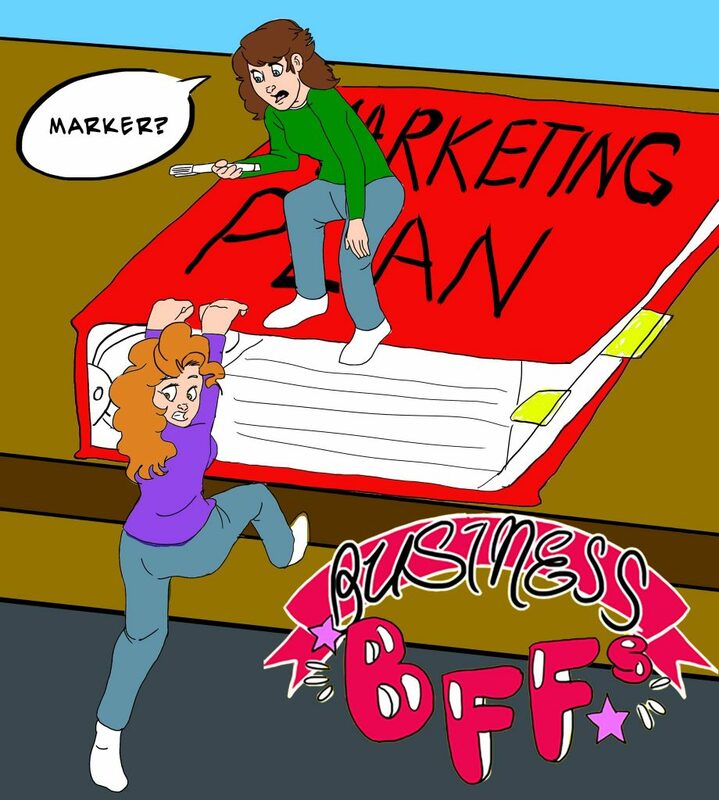 Today on Business BFFs, we talk about being a woman in the sometimes unforgiving, harsh business landscape that is publishing. The whole episode wasn’t going to be about the #MeToo movement and all that surrounds it, but turns out we have a lot to explore there, so here it is. Do you have the PERFECT MOST WONDERFUL novel on the planet and you’re trying to sell it to a publisher? Tune in this week for some GREAT TIPS on how to submit and pitch a publisher. What do you do when you’re at a party with an editor? Are you trapping innocent publishing professionals behind tables with your awkward pitches? (STOP DOING THAT) What if I submit to a publisher and I don’t hear back, does that mean they’re stealing my PERFECT IDEA (no). Listen and soak up all that delicious knowledge while you are forever sucked into a black hole. It’s okay though, you turn into money!! We’re approaching spring ( it’s snowing so much ) and you know what that means….MANY STRESSFUL HOURS OF DOING YOUR TAXES! But it doesn’t have to be stressful, we’re here and we’re fun so maybe business finances and taxes can be fun too, right? Amirite? Yeah? We’re here to answer simple questions like, how do I keep track of my income? Do I need an accountant? Do I have to charge tax as a small business in Canada, and when do I HAVE to? WILL IT EVER STOP SNOWING EVER?? No. PS: Sam’s audio decided to be so hot today it blew her out of the sky. Sorry for that! Clare cleaned it up as best she could given the time, but hopefully you still listen, Sam’s got some hot business tips for you. 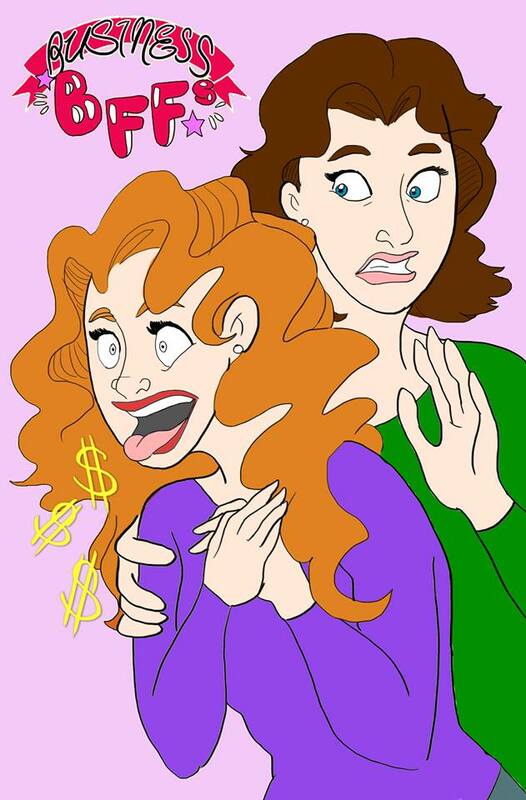 The Business BFFs are back with a NEW EXPERIMENT! For two weeks, we went on a social media diet – that’s right, no Facebook, Twitter, Reddit, (or Etsy & Amazon in Sam’s case) – and we both had very different results. We discuss our relationships with social media and creativity/productivity, the drive to be “recognized,” the loneliness, Black Mirror, and also, is this a musical episode? Pretty sure someone told Clare it was the musical episode. Episode 17 – Grants 101 AKA Commit to the Bit! Grants! Fellowships! Money! What does it all mean? As an indie artist or writer, you’ve probably heard that there are funds out there that could help you get your project off the ground—but BY GUM, where do you start? What grants are available and for how much? What do you need in order to apply? Are you even eligible? Or would it be better to walk through some standing stones and fall through time and churn butter until you reach the ripe old age of forty-two and say NAY to grabbing Federal Arts Funding at all?! Don’t worry, the Business BFFs got you covered. Both Sam and Clare have applied for, and even received arts grants in their fields, so they’ll tell you how to start, where to look, and pass along some hot tips for making your grant proposal shine with their behind-the-curtain insights! Posted on January 24, 2018 January 24, 2018 Leave a comment on Episode 17 – Grants 101 AKA Commit to the Bit! Episode 16 – Twitter & Social Media Safety AKA How Is Your Flesh Prison? How is your flesh prison today? Would you like to buy a robot body? Perhaps you would like to be a Cybermans? No thank you, I AM OLD AND WOULD LIKE TO STAY THAT WAY! 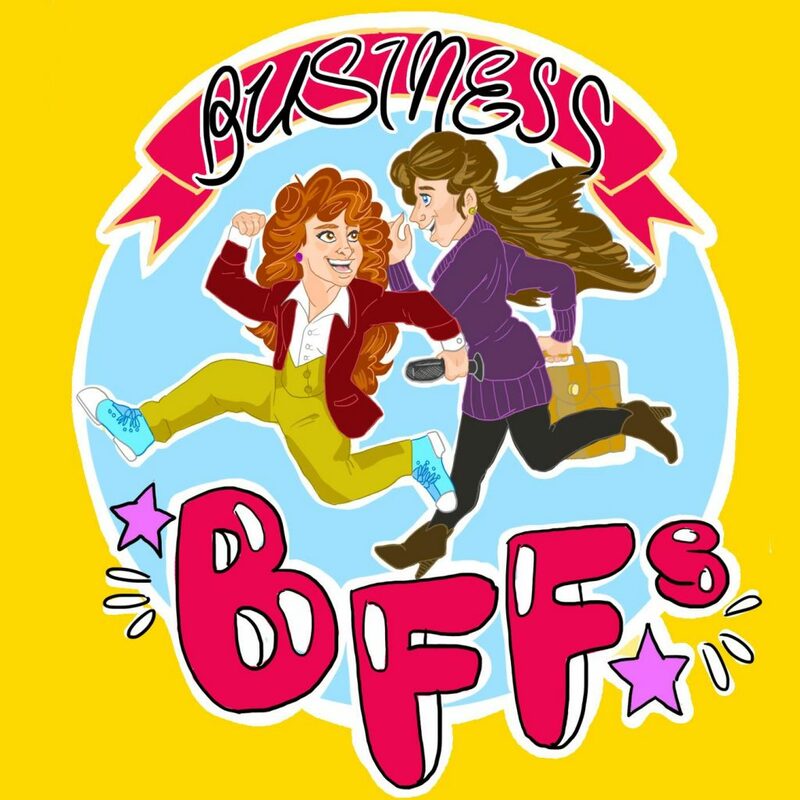 Hi, we’re the Business BFFs, has the above scenario ever happened to you or your loved one? Never fear, jump on Twitter and we’ll show you the right way to strategize and get in the mindset of using this somewhat contentious, but often hilarious platform. 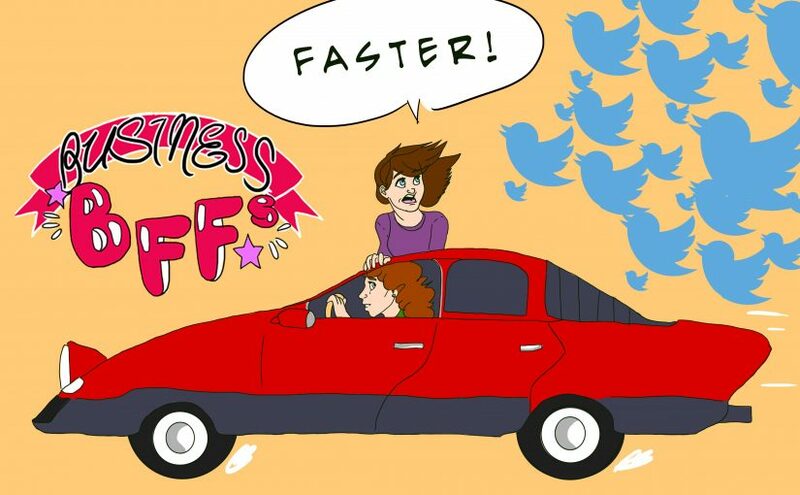 If you’ve ever wondered, is there a BEST TIME to tweet, turns out, there is! Also, serious Twitter talk. Plus, a fun new segment where Sam shows off her Twitter knowledge. Apologies for occasional, very slight wonky audio. Posted on January 10, 2018 January 10, 2018 Leave a comment on Episode 16 – Twitter & Social Media Safety AKA How Is Your Flesh Prison? Episode 15 – Q&A AKA Moist in the Mouth?! Here it is, our last episode of the year! Thanks to everyone who sent in many great questions! You will all be rewarded with many answers on this FESTIVE HOLIDAY OCCASION. We discuss time management at length, publishing 101, publishing distribution 101, and what happens in that Hallmark movie again where the writer somehow gets to be a princess?! Please enjoy this very silly, very informative pod. Posted on December 27, 2017 January 24, 2018 Leave a comment on Episode 15 – Q&A AKA Moist in the Mouth?! This freeform conversation about our 2017 year is a loose follow-up to our goal setting episodes! But is it better than the Star Wars Prequels?! I dunno, that Duel of the Fates song is PRETTY GREAT. How was your year? What goals did you meet, and where did you fall short? We talk about our income, our achievements, and what we want to do better next year. Which definitely means more books and singing in a Welsh choir. Also, send us your questions for our Q&A in two weeks! Ask em here or on the Facebook group. Everything I do MUST be important enough that SOMEONE from the local TV station will SEE ME, right? Uh, not exactly! Clare puts her expensive journalism degree to work for this episode and explains what makes certain stories so compelling, because we’ve all wondered how a journalist’s brain works, right? No, you only want to hear us talk about Outlander some more? YOU GOT IT. Sam elaborates on why tofu is tasty the time-honoured tradition of writing press releases: when you should do it, how to do it, and David Demchuk is a real person, right? Is Sam really a Giller longlist nominated editor, and if so, does that make Clare a Giller longlist nominated eBook coder? No, c’mon now, let’s not get ahead of ourselves and dig into the BONE MOTHER of this great topic. Also, Sam and Clare were on Greg’s new podcast, you can listen to them talk about themselves and their creative process here. Man, I thought freelancing meant I could stay at home in my pyjamas eating BONBONS! Bzzzt. Wrongo! Clare and Sam are here to tell you that meeting people in your field is crucial to building connections, even if they’re loathe to call it networking. Learn some basic tips for overcoming that anxiety, how not to over-pitch yourself, and what tools you’ll need to turn any interaction into sweet sweet business. Guest starring Sophie the dog, AKA Garbage Jesus. Who do you think you are?! No, really–it’s an important question, and one you’d better drill deep and ask yourself if you’re ever going to solidify that brand of yours. Wait, what brand? Exactly! Clare and Sam dive into what exactly branding is, why it’s important, and turning the intangible into something your customers can connect with. Go beyond the logo and the colour scheme–the Business BFFs got your branding back! 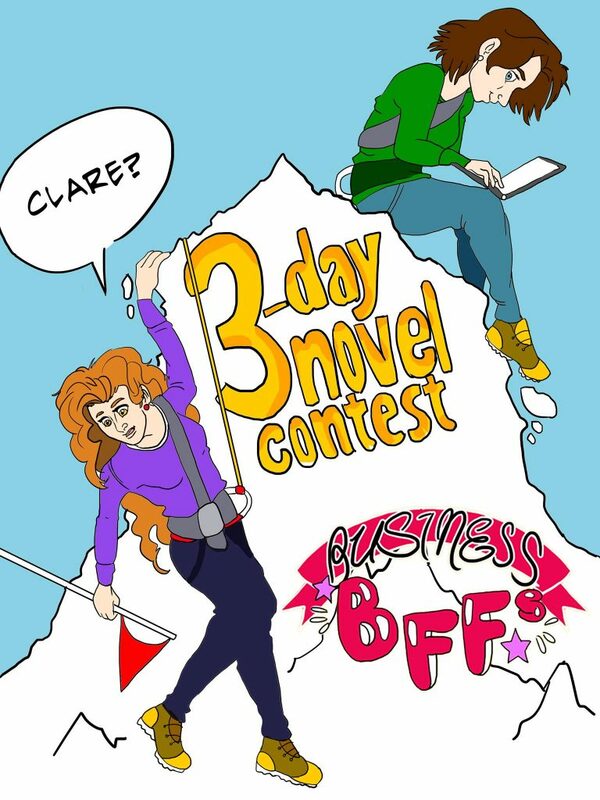 Get in gear, gather your story ideas, and invoke an arcane power that includes but is not limited to demons—Clare & Sam did the Three Day Novel contest! A month ago! The only question is, did they survive? What kinds of trials and tribulations did they endure working on their own respective projects? Have their skulls been scooped out like so many pumpkins, and what are the benefits, if any, of front-loading a ton of writing in three days? Join the BFFs on their 3 Day Journey into Madness and maybe you’ll learn a thing or two about the discipline of writing—or, at least, the sheer pigheadedness of it. Extra music in this episode by Podington Bear. We know you have these big dreams, but are you struggling to achieve them? Time to learn how to create a marketing plan. This week, Clare and Sam discuss how to break your dreams down into achievable goals. They go through a list of ten important questions you need to ask yourself, such as: What makes my business unique? Who is my target audience? How do I make a plan when I’ve got so much to do? Did the position of the stars at the time of birth really contribute to Clare’s awesomeness? Climb aboard a submarine OR a tall ship (toot toot!) and learn how to navigate the high seas of marketing plans. Sign up for the newsletter and receive a special gift: the marketing plan cheat-sheet, made so you can jump-start your marketing efforts. Don’t worry, we won’t sell your email address to third parties. Money money MONEYYY! Without it you can’t exactly make a living, but what if you aren’t charging enough of it? How are you determining what it’ll cost for you to DO a given job as a freelancer, anyway? What if you live in the Enchanted Forest and you have to make magical deals with the Dark One? More importantly, how do you define your value in a crowded Hustle-based marketplace where everyone’s trying to get a deal? Sam and Clare have been there, done that, still learning—but they’ve got a pile of personal experience, tips and tricks, plus software suggestions and how to handle hypothetical clients with ‘budgetary restrictions,’ all wrapped up in this episode that’ll have you choking on dollar signs (if you aren’t already)! LINK: If you are interested in learning more about Harvest, our time-tracker & invoice software, click here! Ever feel like you’ve been sucked into a black hole of entirely your own making? Ever feel super overwhelmed by your to-do list but unable to not only complete it, but fill up your year in a meaningful way? BIFF BANG ZOWIE—what if we told you you could PLAN your way out of that black hole? 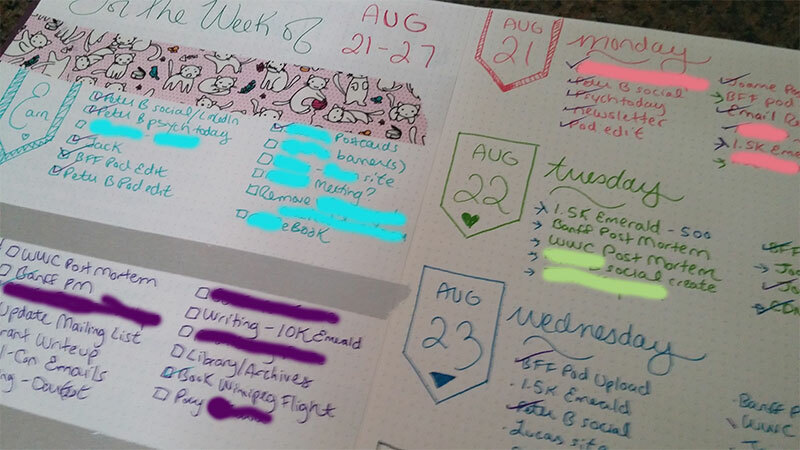 Fresh off a farmer’s market, Clare’s birthday, and the When Words Collide writers conference, the Business BFFs spend today’s episode talking about one of Clare’s tried and true methods for staying organized—bullet journaling. Sam discusses her own methods, but honestly by the end of this episode she sounds like she could use a new one! Join them in getting your sh$&t together in style and keep your calendar from consuming you! Since recording, Clare has gotten a thousand pens for her birthday and thus treats her bullet journal a little nicer. Here’s some pictures of how she organizes her days. 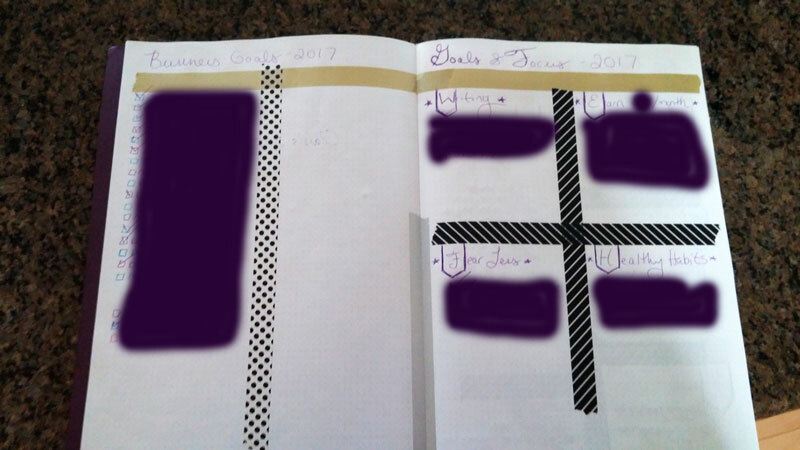 Goals for the year – organized into quadrants – from which I plan my weeks. All my pretty supplies I got for my birthday! 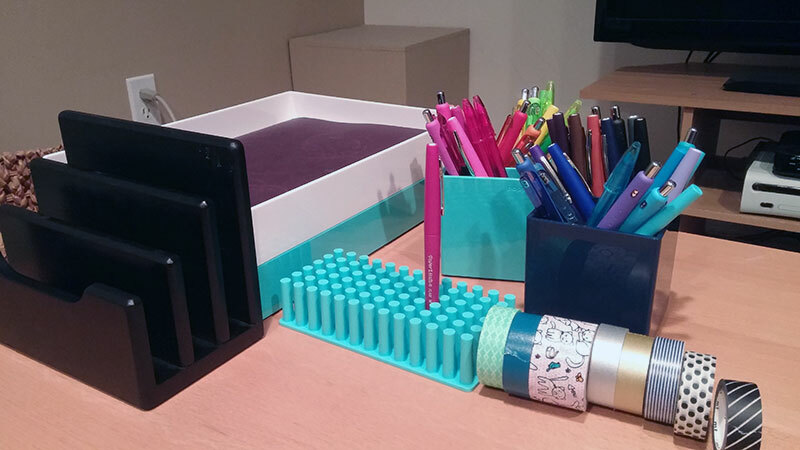 New pens, a pen holder for current colours I’m using, my washi tapes, and file organizers. My desk is much cleaner now!! Whoa nelly, you are just chomping at the bit to get into the convention scene, aren’t you? Now that you’re equipped with Maximum Tabling Knowledge, it’s time to check out the other side of the curtain—programming! 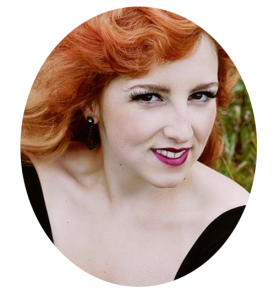 If you’ve got a lot you can talk about—writing, business, marketing, promo—then you’re set! But what if you’re fresh and green, like we’ve all been? How do you get onto programming in the first place—and what even IS IT? You have so many questions. It’s going to be okay. Clare and Sam are here to walk you through different types of programming, why it’s important to participate in it, and some good and bad moments from their own years of Con Experience. If you ever thought the above, welcome to reality! Clare and Sam spend this episode slapping that uninformed thought right out of your body. But don’t worry: they have the info you need to successfully sell your work through these magical things called conventions! Sounds easy, right? Schwing! Schwang! Write that book! Write it in a year? No. Ten years? GOD NO. Write it in a month…or even worse, THREE DAYS! That is totally a real thing that can happen, right? But how? Step 4: Profit and become a famous author! If only it were that simple. 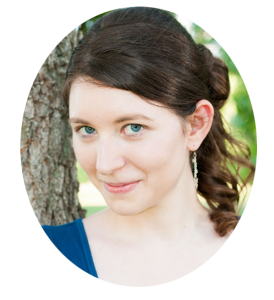 Clare and Sam take you through their experiences writing full-length novels in short windows of time, whether it’s to a contest or a publisher deadline, and they share their tips and tricks for Not Dying before that precious word-count finish line. At the end—a challenge! Sam and Clare discuss one of the hottest, most effective paid advertising methods on the market: Facebook ads! They test out boosted posts and targeted ads on their businesses over the course of four weeks and report their successes and failures. How do you deal with trolls? How do you budget for failure? How much money should you spend? What’s a pop-up tent, is it like Merlin’s bag in reverse? If Merlin ages backward, and the bag ages forward, will anyone still read this podcast description? Don’t just fire things into the night–heed our Facebook wisdom and you will be leagues ahead with your next promotion. Sam and Clare officially land their ship on planet business. Which train do you take to get to fitnessville? TRICK QUESTION YOU HAVE TO RUN THERE. Sam and Clare talk about their efforts in a two week exercise-specific experiment. How do you make a habit stick? Are creative entrepreneurs too busy to be fit? Is bragging about your half-marathon medals just fine? Are there too many birds? It’s okay, just take a break from work, put these two in your earholes, and start moving. Hey, you know what’s a really great way to start off a podcast? Making a bunch of annoying beep and whoosh noises! Yeah! Join Sam and Clare on this brief introduction into their creative business schemes. What do they do for a living? What glorious business tips can you expect from this show, anyway? Will they EVER say the name of the podcast? C’mon, just get in the ship, it’s easier if they show you.